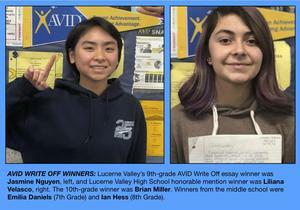 Three Lucerne Valley high school AVID students and two in middle school won awards at the recent 2019 AVID Write Off essay contest. 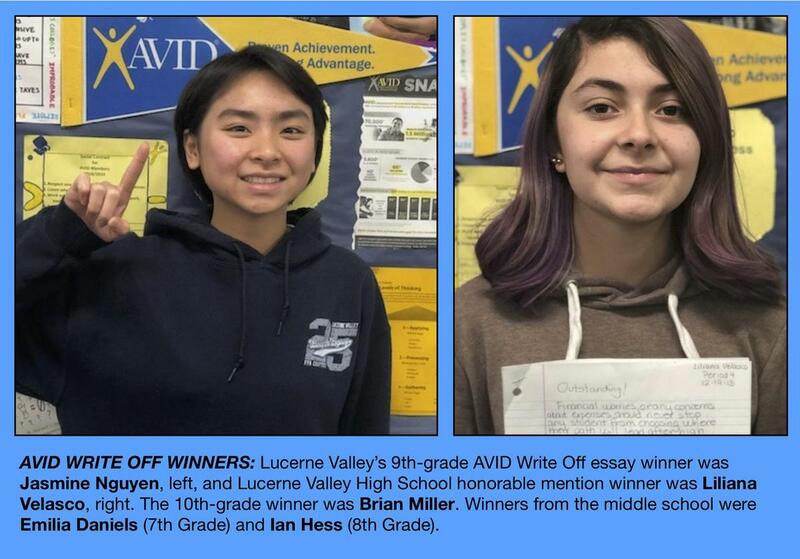 The 9th-grade AVID Write Off essay winner was Jasmine Nguyen and Lucerne Valley High School honorable mention winner was Liliana Velasco. The 10th-grade winner was Brian Miller. Winners from the middle school were Emilia Daniels (7th Grade) and Ian Hess (8th Grade). The Write Off topic this year was "Free College.” Students in all AVID grades read several articles on the pros and cons of cost-free college. They also watched a couple of videos on the subject. Students then interacted with the text and each other through One Pagers and Philosophical Chair activity, Lucerne Valley AVID adviser Naomi Oyadomari said. On the day of the timed “Write Off” all students wrote their essay for 45 minutes, using their articles and notes for resource information and quotes. That was their only form of writing for their essay, she added. Each participating school will select one winner per grade level, with an additional two honorable mentions from any grade level to submit for recognition in the Write Off Ceremony. These Lucerne Valley students will be honored on Thursday, March 21, at the California Theater in San Bernardino. Students will be called up individually by grade levels, among a hundred other AVID students, and be presented their Write Off certificate. Teacher Matthew Roehl also serves as an AVID adviser at the middle school and teacher Kelli Papiernik is a Lucerne Valley High School AVID adviser.